this strip would be more funny if it wasn’t because it is just the naked truth. As PR says, a good satire is never an exaggeration. Just look at all us Yahoos for a swift example. So Mo should have been gentle and told the truth? They would have nailed him to a cross. But, then he could tell the “I can see your house from here” joke. Or the “cross your legs, we’re running out of nails” one. Jesus H. Christ, this is a really tough room. You keep crucifying us with those jokes Jerry, and we’ll have to nail you up. This toon reminded me, too, of Tina Fey doing Sarah Palin. All she did was to quote Palin verbatim, and it was a riot! I love it! JohnnieCanuck, I have a good staple gun, if that will help. Islam’s worst defamers are the extreme fundamentalists themselves. Their own words and actions cause the world to look upon them and their beliefs with disdain. I suggest, then, that they should seek to kill themselves (ala Star Trek’s Nomad). After all, they wouldnâ€™t have to go far to reach their target. If you were inventing your own religion, the victim mentality thing would have to be one of the first ingredients to include. If the in-group believes it’s not being treated fairly – particularly if it’s morally superior to the out-group anyway – that’s a great motivating factor, as well as potential justification for just about anything, ultimately. Look at the poor Scientologists. This one’s a very neat strip btw. Like it. All you needed was that first frame! It was perfect! I just started reading yesterday, and I’m slowly working my way through the entire collection. As a young man growing up in a largely Muslim community, I’ve only recently had the courage to admit to my beliefs as an Atheist to friends and family. The response was just as I expected, my mother cried and I lost a few close ‘friends’ in the following weeks. Ultimately, it was worth it just for the inner-peace. It’s a huge weight off my mind not having to reconcile faith with logic. I can’t stop sharing these comics on Facebook. 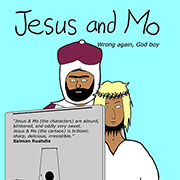 Humor is a great medium for enlightenment, and Jesus and Mo is never short on humor. Thanks, author, for the laughs and food-for-thought.